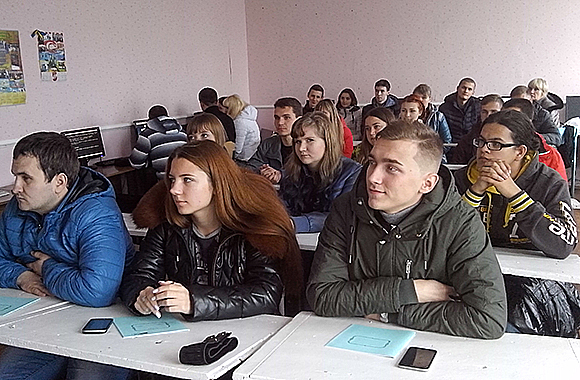 From October 14, a long-awaited study session began at the Faculty of Natural Sciences in the city of Kreminna. Students of all specialties of the Faculty gathered for the study. The first were students-geographers. The very severe weather conditions were relaxed by warmth of meetings with fellow classmates and favorite teachers. Students of all courses attended the study session according to the schedule with great interest. Especially they met freshmen, which were solemnly adopted into the family of students-geographers. Dedication was held in a warm and friendly atmosphere: freshmen honorably withstood all the trials and contests, prepared by the senior students. The evening ended in an atmosphere of mutual understanding and good humor, hymns of geographers and the Faculty were performed with a guitar. On October 20, 2016 students of other specialties of the Faculty, namely: biology, ecology, landscape management, chemistry and biochemistry came to studies. Students of these specialties with a great desire started training sessions, trying to get as much new knowledge and skills during the stationary training as possible. This session will be very important for the master students. The first year master students will have to choose themes of their works and discuss them with the scientific of adviser. The second-year students will overcurrent their almost finished master’s works. In general, the session at the Faculty of Natural Sciences, as always, is held in a businesslike and friendly atmosphere at the same time: training sessions are interwoven with active recreation.